Wow, what a week! My second SXSW Interactive conference and my experience has been amazingly rich this year. I participated on a panel, I judged a dorky fun lunchtime event called Battle Decks, shot 3.5 hours of video (1 of which is of Henry Rollins), met shitloads of amazing, beautiful people, attended some great parties, attended some lame parties and only one kinda weird one. The panel I was on, How to Add Video to a Blog, was Tuesday morning at 10am. Last day of the conference, first panel of the morning, merely a few short hours after many attendees were closing down the house at the Adaptive Path/Consumating/Odeo and Lifehacker parties. To my great surprise, the panel was packed. Many eager bodies overflowing onto the floor to find out about this newfangled videoblogging phenomena. The panel following mine was on videoblog business models and was only half packed. Seems as more people want to learn about the fundamentals of videoblogging rather than cashing in. Probably because videoblogging is still such a new thing to most people. Joining me on the panel was Michael Verdi, Schlomo, Mike Slone from Boulder (thanks for the blank DV, Mike), and Sarah Hepola from New York who moderated. Things started a little slow as we introduced ourselves, talked a little about how and why we got into videoblogging and each showed clips of what we do. As soon as we got the audience involved, things got lively and passionate. Many great discussions about the fundamentals (where to host, compression settings, formats, gear, etc), legal issues (copyright, fair use, creative commons), and what really is a videoblog. Before I knew it, the panel was over. Schlomo closed it out with a great little video of he and his mom shopping for a microwave. Fellow videoblogger Richard Snow taped it and hopefully it will find its way online soon. I stuck around for the vlog biz model panel since this is stuff I’ve been thinking about lately. I was eager to hear from Andrew Baron of Rocketboom about his innovative approach to raising money by auctioning off sponsor slots on ebay. It’s hard not to admit that Rocketboom is the one to watch in the vlog space as they really are blowing up the possibilities on many fronts. Glad to have gotten the chance to meet Andrew and Amanda, whom undoubtably have had a most busy week. Rocketboom is many things, a quirky collection of interesting things done for video, the Amanda brand complete with obsessive fanboys, a passionate community that has lots to say on each and every episode, an expanding empire (Rocketboom.jp just launched, widescreen now, multiple formats and now ad dollars). Ultimately, Rocketboom is just fun to watch. The parties, oh the parties. SXSW is nothing if not a collection of lubricated social opportunities. Every night of the week had several offerings that would have been hard to navigate if it wasn’t for Dodgeball. The little mobile friend locater service that can, proved invaluable for zeroing in on the action. The Adaptive Path/Consumating/Odeo party was probably the best of the lot, not too surprising as Austin local Ben Brown (now Consumating it in SF) knows the right ingredients to make a great Austin party. They include a big enough venue with a large outdooor area (Velvet Spade), local Austin bands (Peel) and an open bar that doesn’t know when to close. The cute asymmetric slanty haired kids were in full force. The pretentiously sounding Red Bull House turned out to be a really nice surprise. Yes, you had to be gifted a key, or know a keymaster, or get on the guest list, or find Buzznet Marc to get past the front door most nights, but all the cool kids and even the annoying drunk New Yorkers had no problem getting past this velvet rope. Once inside, there was the open bar serving Red Bull and whatever, of course. The real goods were the geek interactive art installations. 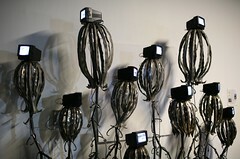 First thing is a metal fabricated sculptural thing with little black and white TVs displaying various blinking eyes that would rotate randomly. There was the Octa-Masher which is an installation containg 8 or so cheap painted music keyboards labeled with different roles such as bass, mashup, melody, remix. In the center was a digital video camera that had some sort of 360 degree refractor lens on it hooked up to a projector displaying the human keyboard players onto a circular band around the room. The keyboards apparently were hooked up to Ableton Live and were triggering loops, samples, pitch bending and other such audio juiciness. Addictingly fun! Then there was the networked Xbox room where 8 players were getting their frag on in Halo 2. Red Bull vodka + geeks + Halo 2 = easy good times. In another room the were a bunch of computers availble for email checking and flickr stalking, though only two seemed to actually have a working Internet connection. Also near here were framed LCD panel displays rotating through party photos. A back room had a DJ decks and some hiphop emceeing going on the last night I was there. Outside was the patio where most people seemed to make social. Other notable parties include: Fray Cafe at the Red Eyed Fly, always great to hear friends tell stories. The Flickr/Upcoming/del.icio.us party which I missed. Lifehacker at the Side Bar, the Blogger party I never got into because it was SOLD OUT. The South by Northwest party thrown by the Vancouver and Seattle kids at the Iron Cactus had it’s debaucherous moments. The closing Media Temple party at the Foundation where the sound was 30 decibals too loud for any decent conversation. This might have been the worst of the lot, but I missed the frog design party this year. The weirdest party award goes to the EFF/Creative Commons fet at the Elks Lodge #201. I navigated past the 84 year old cigar smoking war veterans playing dominoes (it was pizza night) to a lower ballroom. Here The Robot Group was getting jiggy with a couple of remote controlled dancing robots while four unsuspecting partygoers attempted to play homemade theremin instruments that played bleepy 80’s midi music while the host added to the cheese with electronic drums. Too many GETV interviews to name. Look for ’em soon. Also did a bunch for Netsquared. The people. It really was all about the people. I met so many new people, or people I only knew from the Internets. Obligatory shoutouts: Timoni, cute new redhead flying in from my old hometown. The Vancouver crew, Kris Krug, Robert Scales, Will Pate and whomever else I’m missing. Definitely looking for a reason to make Vanc happen again soon. Baratunde, Tony Pierce, Goodstorm Marc, danah, Halcyon, Pesco. Juba Kalamka, thx for CDs and the deep convo! Always good connecting w/Srini and the Mollys. Videobloggers Chuck Olsen, Steve Garfield, Susan, Michael Verdi, Bre Pettis, Schlomo, Josh Kinberg, Richard Snow and Mike Hudack of blip.tv. All the SF locals I always see of which there is too many to name. Crossed paths with Clay, soon to be daddy of twins. Good luck dude! Final shoutout to delicious OnomyJulia whom made my last night almost complete. Few Regrets: Missing the midnight Roomba Frogger in first life. Not connecting with Andrew Baron more when I had the chance. So many questions! Missing many panels with friends on them. Not being able to stay for Music. Bottom line: SXSW is much more than stories and pix can ever do justice. I’ve taken the red pill. I’ll be back.